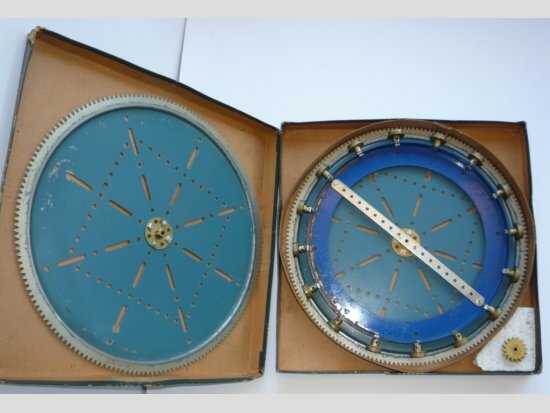 "Meccano a geared roller bearing, the top two plates are finished in a light blue with the central roller in dark blue. 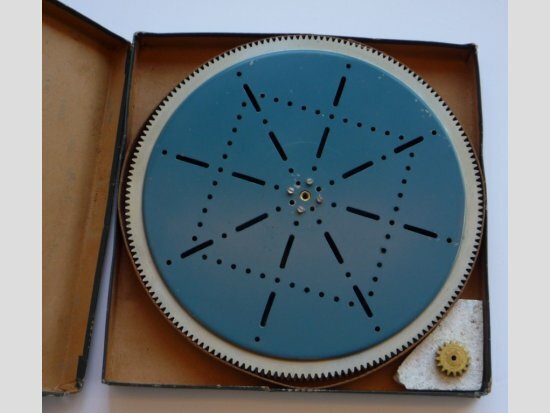 Overall condition is generally Good to Good Plus, contained in an original early box and includes the circular card divider. Good." Well, it sounds interesting enough. The picture raises the ante substantially, showing a very unusual dark green box with gold Meccano lettering and appropriate amounts of battering around the edges for a well-kept example. The guide price was unsurprising, at between £200-300. Plus commission this wouldn't be too bad. ...until we see what it contains. Only the sharpest of all eyes will have seen that this particular GRB has only 175 teeth (a GRB should have 192). It is fractionally undersize, too, surprisingly enough. What is much more serious is that the plates weren't stamped – a guarantee with a GRB that they aren't genuine. ...bought from G Maurice Morris in 1971; just the two discs. I remember counting the teeth and getting a total of 175, but I could quite easily have mis-counted. The advertisement pages at the back of Meccanoman's Journal regularly listed Replica 167's. Two people advertised in the Journal as making replicas. Servetti in '66 and Frampton in '67. I presume the ones Maurice Morris was selling were from one of these sources, but I can't say for sure. Another of these appears in Chris Shute's rebuild of Robot Gargantua. He said that the different number of teeth explained the problems he had when programming it – the ratio is not 12:1 as it should be! You can see this particular GRB in the body of his model to the right. Another repro has turned up in the Rust Bucket forum, but we haven't yet counted the teeth. What is interesting is that this one also has the unusual green box with gold "Meccano" lettering. Was this ever a genuine box? It's not been known as such up till now, and the example we're talking about certainly doesn't inspire confidence, especially since we now have two known with the contents unstamped. Now we look inside the box, we find certainty that we have a problem. 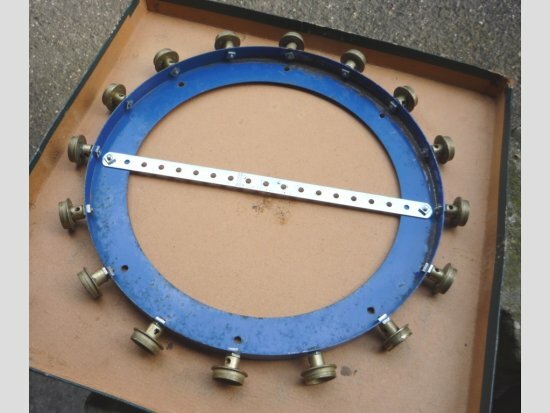 Far from being pre-war parts, the central spider is made up from clearly 1970s parts such as the blue 167b, the zinc plated 9 ½" strip stamped "Meccano England" across its width, and the 1970s finish brass flanged wheels. In addition, this picture makes it clear that the pinion is the post-war sintered brass version supplied with the large toothed quadrants rather than the pre-war milled brass pinion. It's not looking so good. We now have what are certainly reproduction GRB plates with a fairly rough rebuild of the contents of the spider in grotty 1970s parts. The corrosion on the flanged ring just adds insult to injury, in my opinion. 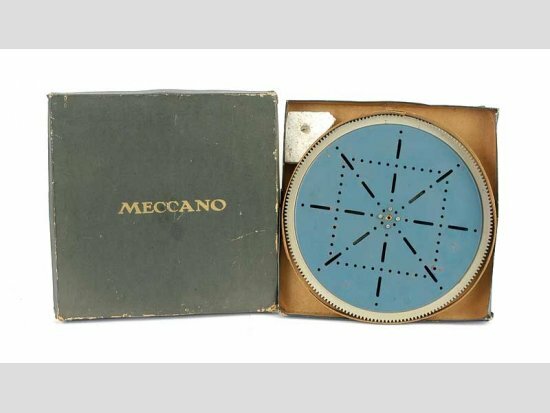 Now, the auction text doesn't specifically claim that the part isn't reproduction, but it does state that it's Meccano – but the only part that is Meccano is the central spider. 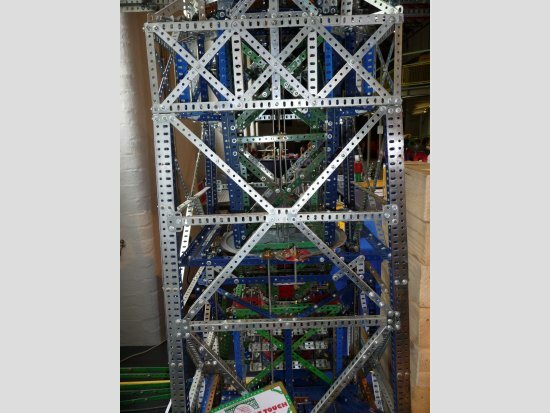 To even the greenest collector of Meccano, these parts aren't pre-war. Neither are they, in any reasonable fashion, "good to good plus". At least, I don't think they are. How carefully are we to expect auctions to check the parts they are selling? It's a difficult one, but this auction reminds us that we have to expect the unexpected on occasions. We've all bought items where something turns up in the box that we didn't expect, and I would imagine that we've all bought lemons too (although many of us won't admit it! :-)) But the point is that if the fourth picture above (showing the inside of the GRB) had been shown on the auction, the price would have been less than half what it ended up as.